A substantial number of patients attending various health care settings suffer from psychiatric disturbances with figures ranging from 15% to 50% (Chadda and Shome  ). A majority of these cases are handled by nonpsychiatrists where majority of them go unrecognized and are subjected to unnecessary investigations leading to inconvenience and financial loss. Inability to correctly identify the psychiatric ailment compounded by social stigma attached to mental illness is thought to be major factors in this regard (Martin  ). Psychiatric exposure of medical and paramedical staff during training is grossly inadequate which eventually leads to insufficient knowledge and misconceptions about psychiatric illnesses and their treatment (Bhaskaran, Trivedi, Kumar ,, ). The recognition of mental disorder also depends on a careful evaluation of the norms, beliefs, and customs within the individual's cultural environment. People tend to have strong beliefs about the mentally ill, and many of these concepts are based on prevailing local systems of belief (Kabir  ). Furthermore, community attitude and beliefs play a role in determining help-seeking behavior and successful treatment of the mentally ill. Unarguably, ignorance and stigma prevent the mentally ill from seeking appropriate help. With this information in the background, we devised a simple questionnaire to find out the attitude of health care professionals toward mental illness in two tertiary care multispecialty hospitals. The present study was undertaken to find out the attitude of nonpsychiatric health care professionals toward mental illness and to find out the difference if any between military personnel and their civilian counterparts. This cross-sectional descriptive study was conducted in two large tertiary care multispecialty hospitals (Command Hospital Western Command, Chandimandir and Government Medical College and Hospital, Sec. 32, Chandigarh). A simple seven-point questionnaire was specially constructed for this study. The questionnaire consisted of two sections. In the first section demographic details were recorded but personal identification data such as name were not recorded to ensure confidentiality. The second part explored the attitudes, beliefs, and perception of the respondent toward the mentally ill. The study instrument was validated using a pilot study of 30 randomly selected subjects from the hospitals. Results of the pilot study were used to modify content and wording of the questionnaire (Appendix A). The questionnaire was administered to 222 medical and paramedical staff (124 military personnel and 98 civilian subjects). The sample included doctors, nursing staff, and hospital administrators selected at random in proportion to the total staff posted at these hospitals. The subjects were explained about the purpose of the study, were assured of confidentiality, and included in the study after obtaining their consent. The results were tabulated and statistically analyzed using Chi-square test and Student's 't '-test. The various categories of personnel included in the study are shown in [Table 1]. The demographic characteristics of the subjects included in the study are given in [Table 2]. The responses of the subjects to the questionnaire are summarized in [Table 3]. The major and encouraging finding of the study was that there is increased awareness about medical nature of psychiatric illnesses (Q1), and it was found to be true for military subjects (Q2 and Q5). The reason could be better training and more interaction between and nonpsychiatric staff. 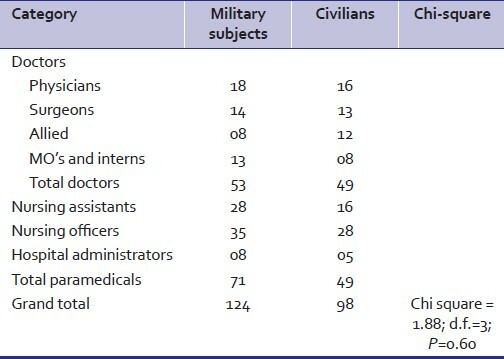 However, a substantial number of civil and military health professionals (significantly less in military population) continue to feel that psychiatric patients are inferior to others (Q2) reflecting the bias against psychiatric patients in medical professionals and paramedical staff mainly due to ignorance. 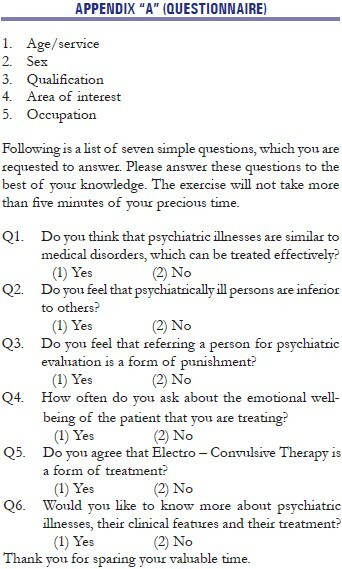 A small number (more among the army personnel) still regard psychiatric referral as a form of punishment (Q3). This finding is in agreement with the findings of an earlier study Prabhu and Singh. Thus in our study literacy was found to be significantly associated with positive attitude toward the mentally sick. Similar findings were reported by Madianos et al. in Greece, and by Alem et al. in Ethiopia. A study on community attitudes toward the mentally ill in New Zealand also reported that those who had previous contact with the mentally ill held informed and enlightened views (Ng et al. ). Interestingly, a recent Hong Kong study reported a generally negative attitude toward the mentally ill despite a fairly good knowledge of mental illness among the respondents Wolff et al. This could explain the negative attitude to mental illness, which was seen in some of the doctors in the present study and support the hypothesis by Wolff et al. (1996) that negative attitudes toward the mentally ill are fuelled by a lack of knowledge. Emotional reaction is known to be an integral component of any illness with its bearing on its severity, course and outcome. However, many health care givers commonly fail to ask about emotional well being of the patient (Q4). Both military and their civilian counterparts were unanimous in their desire to know more about psychiatric illnesses and their treatment (Q6). This is an extremely encouraging sign, since psychiatric exposure of health professionals during training is grossly inadequate in our country Bhaskaran. Positive steps need to be taken in this regard. This study demonstrates the need for educational programs aimed at medical and paramedical staff for providing basic information and thus demystifying mental illness. A better understanding of mental disorders among the medical and paramedical staff would allay fear and mistrust about mentally ill persons in the medical community as well as lessen stigmatization towards such persons. 1. World Health Organization. The World Health Report 2001. Mental health: New understanding; new hope. Geneva: WHO; 2002. p. 1-180. 2. Chadda RK, Shome S. Psychiatric aspects of clinical practice in general hospitals: A survey of non-psychiatric clinicians. Indian J Psychiatry 1996;38:86-92. 3. Martin MJ. Psychiatry and medicine. In: Kaplan HI, Sadock BJ, editors. Comprehensive Text Book of Psychiatry. 6 th ed. Baltimore: Williams and Wilkins; 1995. p. 1637-44. 4. Bhaskaran K. Undergraduate training in psychiatry and behavioral sciences. The need to train the trainees. Indian J Psychiatry 1990;32:1-3. 5. Kumar A, Goyal U, Ganesh KS, Srivastava MK, Gautam BD, Kumar R. Attitude of postgraduate residents towards psychiatry. Indian J Psychiatry 2001;43:97-101. 6. Trivedi JK. Importance of undergraduate psychiatric training. Indian J Psychiatry 1998;40:101-2. 7. Kabir M, Iliyasu Z, Abubakar IS, Aliyu MH. Perception and beliefs about mental illness among adults in Karfi village, northern Nigeria. BMC Int Health Hum Rights 2004;4:3. 8. Prabhu HR, Singh H. Attitude towards psychiatric referral. Indian J Psychiatry 2001;43:57-9. 9. Madianos MG, Economou M, Hatjiandreou M, Papageorgiou A, Rogakou E. Changes in public attitudes towards mental illness in the Athens area (1979/1980-1994). Acta Psychiatr Scand 1999;99:73-8. 10. Alem A, Kebede D, Woldesemiat G, Jacobsson L, Kullgren G. The prevalence and socio-demographic correlates of mental distress in Butajira, Ethiopia. Acta Psychiatr Scand Suppl 1999;397:48-55. 11. Ng SL, Martin JL, Romans SE. A community's attitudes towards the mentally ill. N Z Med J 1995;108:505-8. 12. Wolff G, Pathare S, Craig T, Leff J. Community knowledge of mental illness and reaction to mentally ill people. Br J Psychiatry 1996;168:191-8.